OUR PRICE: $65.45 - Join Rewards Get $6 Dance Dollars On This Item! 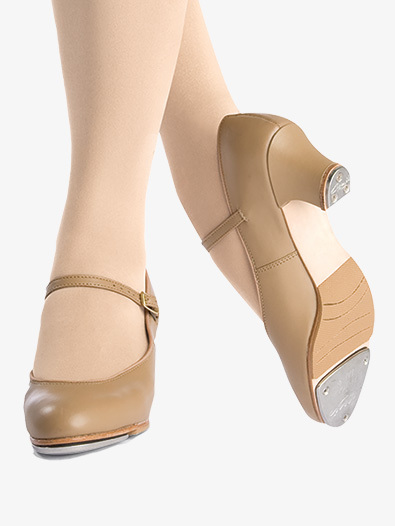 Capezio's "Jr. Footlight" tap shoe features an upper constructed of soft, supple, quality leather. This shoe is lined with moisture absorbing brushed microfiber and other features include a padded insole with arch support, scored leather sole with scored rubber sole patch, a non-slip heel counter, 1.5" fully covered heel and TeleTone toe tap and DuoTone heel taps. These shoes seem to be pretty good. My daughter has only worn them twice. These seem to run quite large. My daughter wears a 9 or 9.5 in her bloch jazz shoes, sansha canvas dance shoes and sansha leather ballet shoes. Her street size is also a 9 or 9.5. I ordered her the 9.5 in these and had to return them. They were HUGE! Reordered an 8.5 and we're all good now. These tap shoes are so amazing! I am a size 6 street shoe. I originally ordered a size 6, but had to return because they were too big. The 5.5 was perfect. I do have bunions, so I went with the wide. Tapping in these shoes feels just as comfortable as tapping in my flats. The toe box is comfortable, the heel stays put/does not slide off, and the shoes have built in arch support. I could easily hit all of my sounds the first time I tried tapping with them. My recommendation is to order 1/2 size smaller than street shoe. Unfortunately, the return policy requires that you pay your own shipping for the return which is a drag, but I am happy I found the size that fits and feels great! Beautiful but runs to the large size. My flat taps are a 7, but a 6 1/2 heel was too large. Unfortunate. Two times in the past month, and when you return, you don't get reimbursed for shipping either way. For loyal customers, this is a disappointment. First, sizing: your street size will fit perfectly in length, but these shoes run very narrow. Second, the heel is shorter in person than it looks in the picture. Third, because of the piping around the upper edge/collar of the shoe, whenever you flex your foot or move it in certain ways, the shoe gaps and widens, like a paper fortune teller/cootie catcher when you open and close it. However, these shoes have AMAZING arch support (the best I've seen in a dance shoe - they look like they have orthopedic insoles in them). From what I've seen of other shoes, I'd recommend the 2.5 inch Manhattan capezio over this. That said, this is still a good shoe and sounds great tapping. Very comfortable, very cute with a nice heel unlike the bloch tap shoes which have a rather ugly fat heel. However, they run narrow and have high arches which is great for me but perhaps not for others. Contrary to the other reviews, this shoe does not actually run a half size large. It fits true to street size, at least for me. The leather was very thick and nice and overall I am very satisfied. These are great! I love them and when ordering it says to order a 1/2 size SMALLER than street not larger so keep in mind when ordering. I bought these to take a 6 week Advanced Beginner/Intermediate refresher course that would segway into a musical production with many tap numbers. The look and sound are amazing, though like the other reviews, the sizing was hard to figure out. I have always ordered a size up due to my wide feet. I tried them on and they seemed ok, but after a few classes and practices at home, the leather stretched and I found them to be loose and that half size made a difference for the worse. I could fit 2-3 fingers in the heel. I couldn't return them at that point so, I've been tightening the strap extra tight and dealing with the extra toe space. Despite that they are super comfortable and are easy to dance in if you are looking to attempt to advance from flats to a heel. Remember that though the fit may be snug at first, it will stretch and loosen the more you use it! I bought these shoes in caramel for a performance. I really like the color and the sound. I had trouble with the fitting though. My normal shoe size is a 9, and I went with what they said for fitting and ordered a 9 1/2. They were huge. I could fit 3-4 fingers in the heel. The size that ended up fitting me was an 8 1/2. I would advise anyone who might order to think about ordering a 1/2 size smaller rather than a 1/2 size larger. Other than the sizing difficulty, great shoe. I ordered these in my regular size and they were really tight and very uncomfortable to dance in. I have really wide metatarsals, so keep that in mind when you order. They make a good sound though, just be careful if you are used to flat shoes for tapping.